Automatic nail file’s easy-grip handle helps those with limited dexterity trim and smooth without hard-to-operate clippers. 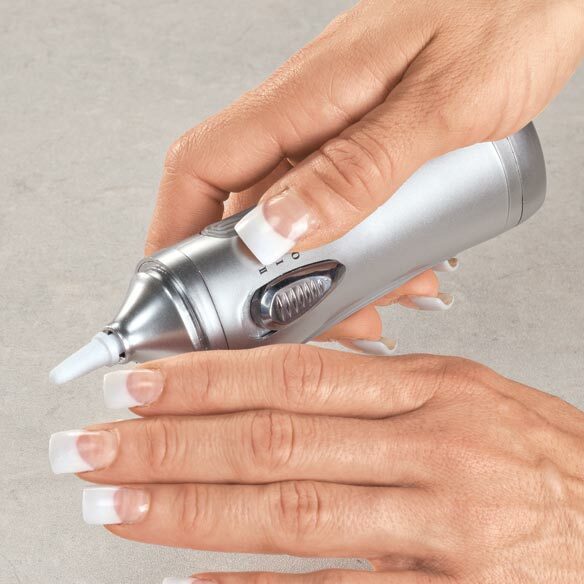 Electric nail file features 2-speed operation, storage cap and 2 rotary-action emery heads: small for fingernails, large for toenails. Requires 2 AA batteries (not included). 7" L.
get them down and filing them worked. hurt but not anymore. Thanks. Someone else helps me with using this because of health problems. It is difficult to reach my feet since hip replacement. Glad I bought this product. Sharon the science fiction author. Use on my husband's toes - makes it easy instead of hand filing. Does exactly what she wants! Got this for my wife who has thick nails (fungus) and it works perfectly for her. It is powerful enough to even out the nails and is very easy to use, She is very pleased I purchased this for her. It works really good as far as smoothness. Good for both nails for hands and feet. 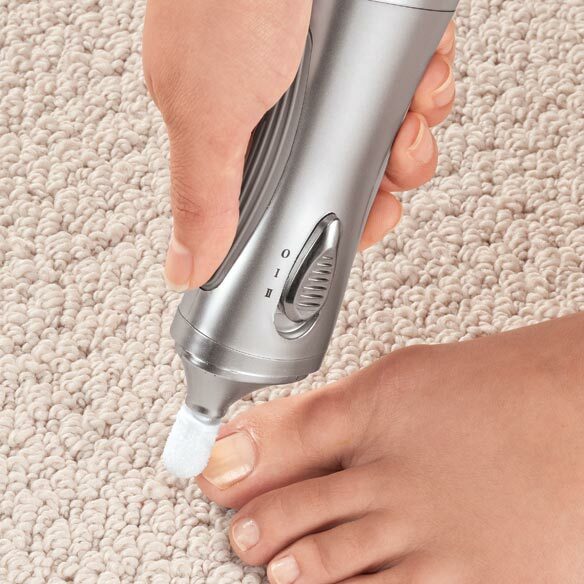 I use it for shaving down toe nails . Clippers are hard to use with thick toenails . Great for shaping finger nails . Glad I got this tool. Need to soften nails before using as it removes slowly. It is not well made but works great on my toenails. At 80 yrs old my toenails are difficult. Right after shower I do toenails and it beats cutting where I alway cut skin on one or two toes and that can get infected. This item is a little hard to hold in place. It wants to fly off to the side if not holding firmly. Seems to take a little time to actually file the nail. Regular fingernail file material or sandpaper like material would work better. I would recommend with a change in material. Otherwise it's a take a chance and make your own decision. I bought this item hoping to be able to groom my toy nails. First hurdle was to even open the case. It tells you in the little booklet (several times) in order to remove the battery cover to STRONGLY press on the sides of the cover. Because of my arthritic hands I was not able to do that. Living in a large apartment building I can always find someone to open things for me. This was not that easy. Took a young person about 15 minutes to get the cover off. Second hurdle. After inserting 2 AA batteries the cover would not close. Directions say to match up the arrows (almost impossible to see the arrows (one tiny one on each side of the case. My hands were really aching by this time and I was about to return the item. Finally, a click and the case was closed. Third hurdle. You must be very careful with this - I slipped off the nail on one toe and made a small cut on the skin of the toe. For a diabetic, that could be serious. Since I was able to get the battery cover on, I will not return the item; but, I caution anyone thinking about buying it. You must have strong fingers and hands or have a friend or neighbor who does. I was looking forward to the automatic nail file, because I volunteer in a nursing home doing manicures. However, this item is rough and way too fast for smooth filing nails. I could not open the battery case without prying a knife in it, and I could not close it. Shipping back is not worth it because of the high cost of mailing. Do not buy it.
" My Disappointment With Item"
I am totally disappointed with my purchase. I installed the batteries and proceeded to try to remove the clear top and the whole inside came out. To make things worse, when I pushed it back inside, it ran constantly with the on/off button off. I really had plans to use the item quite a lot. this nail file is useless. it does not do what it is advertised to do.it cost too much to send it back so I am stuck with this piece of junk. you also have to use a pliers to get the cap off of the battery space. I am legally blind and can not see to do my nails so I thought that this would be the solution but I will know better the next time. Will I ever know how good it is? In order to use the Nail File ,batteries must be inserted. Since I long ago failed my Charles Atlas muscle building mail-order course, I haven't strength enough to open the case to put in the batteries required. The directions tell me to squeeze and pull. I have squeezed and pulled to no avail. I considered a hack-saw, but that wouldn't allow for closing the case. I believe that my strenght is near normal for my age, I have no trouble with tasks of my ordinary life. I have not tried pliers or other mechanical aids as they would maul the case, or worse. Hence, I cannot report on its functioning and my evaluation of it. Could not use this. Well, it's pretty cheap compared to, say, the Dremel tools so I guess you get what you pay for. Battery compartment very difficult to open. Mechanism for tip is off center so tips don't rotate correctly, making it impossible to use accurately and safely. THIS PRODUCT DID NOT WORK......USED SEVERAL BATTERIES AND IT STILL DID NOT WORK. I was looking forward to,using this product, so disappointed it arrived defective. I want a credit on my account. Very disappointed. Please contact me regarding credit. I will return the unit if I'm sent a return mailing label. BOUGHT THIS TO TRIM THE NAILS OF A DISABLED LEFT HAND BUT WAS UNABLE TO GET IT TO WORK CONSISTENTLY. THE CASE WOULDN'T STAY CLOSED. Buy some emery boards, they work just as well as this product. Poorly made, case would not stay shut. Probably a good idea but too cheaply made; at least ours was. Old folks With Old Feet. Bought this and replacement tips. Put in brand new batteries and it just doesn't work. Would cost too much to send it back....so in the trash it goes. In trying to make something work that should have been simple, I ending up throwing the product in the garbage. Couldn't get the cap off of it. The 2nd time I tried to use it, when I was trying to pull the cap off, the bottom part detached and the mechanics fell out. Tried to put it all back, but it now runs ALL THE TIME, even in the off position. I'm throwing it away. It should be AC not Battery. It stops spinning if you put any pressure on the spinning files. If it was AC, then it would probably have more spin to it. I was disappointed. It looked like it was the answer to my problem. I wanted to purchase the step up item at almost twice the money but your sales person stated that they had a lot of complaints about that one also. I need an easier way to file toe nails. I thought it would help to reach my toe nails since I am 93 years old. It's what I've been looking for. If it works, it will make nail trimming a lot easier. Much easier to file nails then nail file. To smooth off my nails when they are trimmed. As I get older, my toe nails are really getting thicker and hard to trim and reach. I'm old and doing my toe nails is hard to do. Will be easier to file my dad's nails as they are very thick. It works for light filing and easy to use. Hopefully to trim my toe nails easier. I have used it for a long time, and it's working for me. For fast and easy nail trimming, however, tool would be better if RPMS were faster. It is not always easy to cut my tie nails with a file, hope this will do the job. I have trouble reaching my toes. This might help. Just trying it out, Toes hard to reach. refills small for fingernails and refills large for toenails? yes or no how much money charge for the refills? BEST ANSWER: Thank you for your question. We sell the replacement heads, item 349639. We are including a link below directly to the item for you. We hope this information will be of help to you.